This riveting narrative explores the lives of six remarkable female pharaohs, from Hatshepsut to Cleopatra - women who ruled with real power - and shines a piercing light on our own perceptions of women in power today. Female rulers are a rare phenomenon - but thousands of years ago in ancient Egypt, women reigned supreme. Regularly, repeatedly, and with impunity, queens like Hatshepsut, Nefertiti, and Cleopatra controlled the totalitarian state as power brokers and rulers. But throughout human history, women in positions of power were more often used as political pawns in a male-dominated society. What was so special about ancient Egypt that provided women this kind of access to the highest political office? What was it about these women that allowed them to transcend patriarchal obstacles? What did Egypt gain from its liberal reliance on female leadership, and could today's world learn from its example? 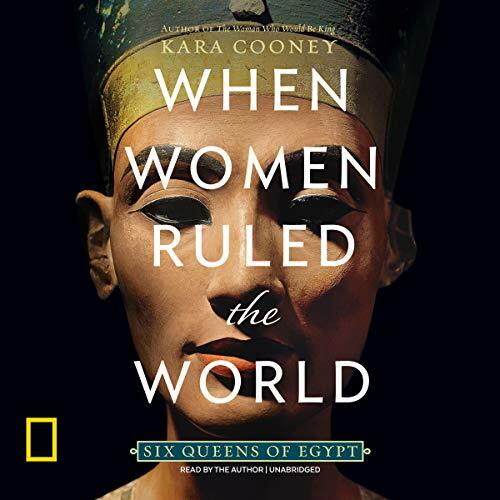 Celebrated Egyptologist Kara Cooney delivers a fascinating tale of female power, exploring the reasons why it has seldom been allowed through the ages and why we should care. ©2018 Kara Cooney (P)2018 Blackstone Audio, Inc.
Kara Cooney Ph.D. points out that ancient Egypt was punctuated by periods of rule by women. Many women ruled as regents for their young sons; then advised them privately when they took the throne in their teens. Cooney reviews the reign of six female pharaohs of the Ptolemaic period that ruled in their own right. They are: Merineth, Neferusobeck, Nefertiti, Tawosret, Hatshepsut and Cleopatra. The author discusses their similarities and differences of their reigns. Cooney describes how Hatshepsut and Cleopatra took and held power. The book is well written and meticulously researched. Cooney reveals how these women survived in a male-dominated world. The author points out that women in ancient Egypt had the right to own property, and the right to divorce. I found the book interesting and could not help but make comparisons in my mind to women’s rights today. I found the book most interesting and will look for more books by the author. Kara Cooney is a Professor of Egyptology at UCLA. The books nine hours and fifteen minutes. Kara Cooney narrated the book herself. As always, Kara Cooney provides a great story into arguably the world's greatest ancient civilization, Egypt. She provides a revealing, thought provoking approach to women in power, and highlights how each woman Pharoah handled their individual reigns. She ends on a high note, offering valuable insight into the benefits of a woman being in charge of any given society and how the six known female Pharoahs in history can provide guidance for us today through example alone. I highly recommend this book to anyone who is interested. First I want to say that I understand Kara Kooney’s frustration with gender inequality. I recognize the way we make allowances for powerful men, yet hold our powerful women to completely different standards. However, I don’t think she should write a “history” that is so tainted by her agenda. As someone else pointed out, this book would have been far more effective if she had let the history speak for itself. Unfortunately, there is such fragmentary evidence of the lives of many of these women that much of the book is speculation. A very good treatment of an often neglected subject. If there's any criticism is that the books is too short. Just dry at points. Loved the general idea of how women lost their mojo, but like any history book, beware of historical info getting dry. Personally, love history so I overall liked it. I love this author, and this is another example of her amazing work. It was great to feel like we knew the great female pharaohs. I bought this book because I love Egypt, and as a feminist woman myself, am very interested in its queens. For someone who is not formally educated in ancient history such as myself, it was an interesting look on the past and the few instances of female empowerment within it. I believe rather than write a factual and informative book about Egyptian queens, she seeks more to make a modern political statement more than anything. Trump and Clinton make frequent appearances, taking up almost as much time and emphasis as its titular queens, and thoroughly infects what could be a fascinating and enlightening look on ancient women. After finishing this book and doing some more research on the source material, there are some factual errors regarding some numbers and figures. The author admittingly puts a very positive spin on each queen and almost always attributes their failings to men or external factors. Whether or not this is the case, as the author also says, perhaps we will never truly know. Its epilogue is also an interesting addition, though it makes what has otherwise been a book of history on ancient women into something more like a very long feminist essay. It has interesting thoughts, but our modern outlook on feminism did not exist in the ancient world and looking at it through our modern moral and societal lens distorts it and what truths we do know about it considerably. While not 100% accurate and quite political, I still found this book an entertaining and informative entry for the history lay-woman to ancient egyptian queens. My only recommendation to those looking to enjoy this book despite its political leanings and slight inaccuracies is to use this as a stepping stone into further learning of ancient Egypt rather than taking it purely at face-value. Would I recommend this book? Yes, however, I would definitely warn readers of its politics and its inaccuracies and offer further reading on its subjects. Did I enjoy this book? Yes and no, despite sharing similar views to the author, I felt the inclusion of modern politics distracted from the queens and their fascinating history. I wanted to hear less about Clinton and Trump. Love Kara’s voice both literally and in terms of the narrative way she spins each tale of each woman and her times. LOVE the epilogue. Well presented fascinating book. It speaks to and more throughly addresses rulers usually glossed over or ignored. The author is also an excellent narrator. Learned if also manichean feminist tract. Women=good. Men=bad. If you go for this type of female chauvinism, then this book is for you. A straight history would have been effective to show how strong, cany women in antiquity could rule effectively in a man's world. Instead, too often here we get feminist polemics, almost always tied to how great Hillary Clinton is and how bad the author sees Donald Trump being. Sad. She could have empowered her readers, female and male, to draw conclusions she favors. Instead, she does their thinking for them and alienates them. Certainly me, anyway.